What You Can Do To Help A Child in Need. Right Now! Today! Not everyone can be a foster parent. I certainly understand. As one who has been a foster parent for over 50 children the past 13 years, I understand that not everyone is able to care for children in foster care in their own home. It is the hardest thing I have ever done. To be sure, though, it is also the most important and most rewarding thing I have ever done, as well. Yet, you CAN help a child in foster care. Even if you are not a foster parent, you CAN help a child in need. There are many ways you can make a difference. Just like the lovely couple at my church that has a heart for children in foster care, yet are unable to be foster parents themselves. For years, now, they have watched my wife and I take care of dozens of children, some staying for a few days, while others staying for several months, and even years. This couple has been a blessing to my wife and me each Christmas, as they have taken the mantle upon themselves of being our "foster grandparents." Each Christmas season, they purchase presents for every foster child that is in our house. This has helped my family ensure that our children in foster care have an extra special Christmas day with the joy of receiving gifts under the tree; gifts with a child's name on it. Sadly, far too many children in foster care have never had gifts to open on December 25th. My wife and I try to make it a day that the children both never forget, and one that they are able to escape their pain and suffering and simply revel in being a child. Our "foster grandparents" help us accomplish this. Like our dear friends have done, churches can reach out to the foster parents in their community and "adopt" a child during the holiday season, or other times of the year. This might also include helping out school supplies at the beginning of the school year, birthdays, paying for school field trips and summer camps, and other activities that are special to the child. Indeed, many foster parents simply cannot afford to provide all of the opportunities to their foster child; opportunities that help the child escape from their trauma, and opportunities to heal from their suffering. When church members come together to help the child in such fashion, they are also giving a blessing to the foster parents, as well. I recently heard from one foster parent who told me that their church was collecting new and gently used suitcases for the foster children in their area. When a child came into care in their community, the church would work alongside the town's foster parent association, and make sure that each child received a suit case. In fact, there are many such organizations across the United States that provide similar services. When a child comes into care, all too often he comes with a black plastic bag containing the few items in his possession, gathered together quickly by social workers and even law enforcement officers, in a hurry to collect both the child and his possessions in a quick manner. For older children in care, this black plastic bag can be an embarrassing symbol of all that is wrong in their life. Later, when a child in foster care moves, whether it is to a new foster home, an adoption family, or reunited with his birth family, the gift of a new suitcase can be a sign of pride, respect, and love. -Collect new or donated clothing, toys, bedding materials, and other necessities for foster children. -Be a Mentor to foster children. - Host foster children who have aged out of the foster care program, and are no longer living in a foster home, or helping to pay for rent and accommodations for the teen. -Donate school supplies and backpacks for foster children. -Donate to a foster parent fund, helping to support local foster parents. -Help to pay for summer camps and field trips for foster children. -Set up a fund in order to aid former foster children in their college and post high school education. Perhaps the biggest impact you can make for children in foster care is to become an advocate of change. By contacting lawmakers, politicians, and publicity agents through means of emails, letters, phone calls, and other means of communication, you can, right now, bring attention to the needs of these children who are facing a series of challenges in their lives. Along with this, as an advocate of change, you can also post information in editorial letters, websites, public forums, and so forth. By lobbying for change, new laws can be introduced, and information can be brought forward to the general public. So, the next time you say to a foster parent, "I couldn't do what you do," that's okay. I am sure they understand. Yet, you can make a difference in the life of a child that is living in your state, your city, and ever your neighborhood today, right now, without being a foster parent yourself. For thousands of children in foster care, they hope your answer is "Right now!" 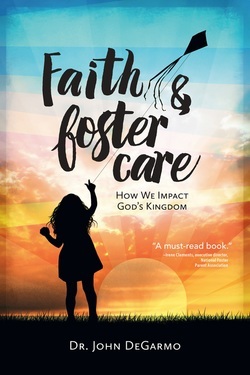 For more ideas on how to help children in foster care, pick up the new book Faith and Foster Care: How We Impact God's Kingdom.